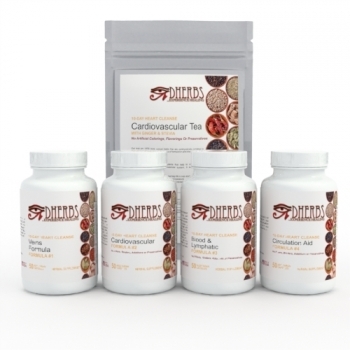 The Dherbs.com 10-Day Heart Cleanse is an effective, all-natural Cleanse that can help contribute to the maintenance, optimal health, and proper functioning of your heart. The heart is the primary organ of your circulatory system; on average, it beats about 100,000 times per day, helping the cardiovascular system transport oxygen, nutrients, hormones, antibodies throughout the body to their intended destinations while assisting in the transport of waste and unwanted entities.A variety of things can interfere with the efficient functioning of your cardiovascular system, including arteries clogged with fatty plaques and hardening of the arterial walls, which can be affected by poor diet, not enough or no exercise, obesity, and cigarette smoking. In addition to hereditary and environmental factors, stress can have a significant effect on your heart’s health. Stress, tension, and strong emotion can often affect the rate and rhythm of your heart, disrupting its ability to function normally. Therefore, a multi-pronged approach is necessary for maintaining optimal heart health. The relaxed lifestyle is one factor. A healthy diet is another. Removing other bad habbits from your life, including smoking, excessive alcohol or caffeine use, and drug abuse, is also an important element. Handicapping yourself by allowing these factors to make your heart work much harder than it needs to can lead to a variety of complications. What Does The 10 Day Heart Cleanse Consist Of? What’s the difference between the 10 Day Heart Cleanse and the Full Body Cleanse? The difference between the 10 Day Heart Cleanse and the Full Body Cleanse is that the Heart Cleanse is a concentrated cleanse for the heart and cardiovascular system whereas the Full Body Cleanse places emphasis on the whole body (including the heart). How Often Can Or Should The 10 Day Heart Cleanse Be Performed?